each night. It is common throughout the United Kingdom to see people attempting to lure hedgehogs into their gardens with treats and hedgehog-sized holes in their fences. 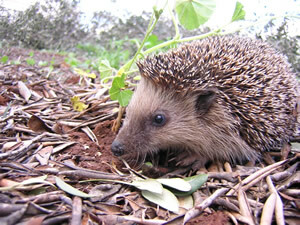 One problem with using hedgehogs for garden pest control is the use of chemical insecticide. While the hedgehog is large enough to resist most insecticides, it cannot withstand them if it eats many insects which have become full of the poison. This causes many hedgehog deaths where pet hedgehogs eat contaminated bugs within the house. In areas where hedgehogs have been introduced, such as New Zealand and the islands of Scotland, the hedgehog itself has become a pest. In New Zealand it causes immense damage to native species including insects, snails, lizards and ground-nesting birds, particularly shore birds. As with many introduced animals, it lacks natural predators. With overpopulation, it kills off more insects than initially intended and expands its diet to include things such as snails, worms, and the eggs of wading birds. Attempts to eliminate hedgehogs from bird colonies on the Scottish islands of North Uist and Benbecula in the Outer Hebrides have met with considerable opposition.